Patdbossct had the most liked content! 8 AB's, 11 AC's, 4 AK's, 2 AL's, 3 BX's, 2 BM's, BL, 2 BQ's, BF, BG, BC, ED, EQX, 2 FN',s FG, FH,2 FJ's, FK, FT, FW, LFT, LJSWX, 3 B61's Macks, 3 DM600's, 2 DM 800 Mack, 3 R600, 55 Granite Macks, 3 Mack Jr.
8 AB's, 11 AC's, 4 AK's, 2 AL's, 3 BX's, 2 BM's, BL, 2 BQ's, BF, BG, BC, ED, EQX, 2 FN's FH,2 FJ, FK, FT, FW, LFT, LJSWX, 3 B61's Macks, B-81 Mack, 3 DM600's, 2 DM 800 Mack, 3 R600, 2 RD 600, RW-713 Superliner,52 Granite Macks, 2 Mack Jr.
Any idea who made them ? Who made that signal light switch (the box one in the pic) I remember seeing one as a kid but never seen one since ? 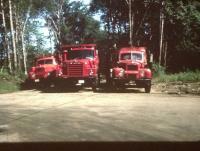 Was the Mack 'DM' model designation used in the 30s-40s? More than likely its someones' mislabeling of a picture of a BM model. A lot of auctioneers have done it. You can ask the Museum for the records for all Mack Jr's produced and sold, then comb through the pages till you find the buyer yourself and the vin will be attached. They do this for no charge, but I'm sure they would appreciate any size donation, since its a little more paperwork to copy for you, than most requests. They do have tons of knowledge and are always friendly and willing to help when they can!